Can you think of a better time than Halloween for your dog to play dead? This year, while you’re planning your Halloween costume, don’t forget to include Fido in your monstrous creativity. Of course, you could always run to a nearby store to pick up the typical superhero or monster costume most dog owners choose every year. But where’s the fun in that? Instead, consider doing something unique this year, something with a little wit and a lot of fun to it. There’s nothing quite like a DIY Halloween costume—especially when they’re for pets. Here are some crazy canine costume ideas for people who love to get a little spooky. 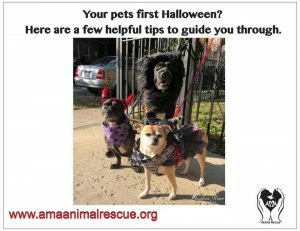 If you don’t normally take your pup on a walk at night, and he’ll be joining you for trick-or-treating festivities, make sure you have the right gear for nighttime walking. You’ll need a reflective dog harness, leash, and/or collar. Collars with blinking and LED lights can also be used to ensure he’s easily visible to drivers and passerbys. If you’re customarily a collar user, Halloween night might be a good time to try a harness, which fits around a dog’s neck, chest and ribs. It’s an especially good way to keep a larger dog under control if he gets excited. If you don’t want something to complex, that’s okay. This one’s very easy to pull off. All you need is a bandana, some red dye, and a novelty knife headband (like this one) from your local Halloween supply store. Dye the bandana red to simulate blood, and tie it loosely around your pet’s throat so it’s covering the part of the fake zombie knife that’s strategically placed over top of his neck. Voila! You’ve got what looks like a perforated pet wearing a blood-soaked rag. It’s so much fun, you just might get more laughs than shrieks. If your dog is more of a formal dresser and you’re hitting the party circuit this Halloween, you’ll want him dressed to impress. In that case, check out this bow-tie-and-cuffs look from Rubie’s Costume Company, including a full-on collar, bow tie, and cuffs with cufflinks for all four legs. It’s doggie formalwear fit for any occasion—and for less than $3! Dazzle the neighbors this Halloween with a dino-dog costume that hearkens back to the Jurassic period. This fun DIY dog costume is a classic that only requires some cloth and a little sewing know-how. You’ll need enough cloth to fit around your pooch’s body, with holes cut for each leg, and five or six small pieces of cloth cut into triangles. Put cardboard inside the triangles to hold them erect along the top of your pet’s back. Bet you’ll be the only barking Stegosaurus owner in the neighborhood. If you’re looking for something a little different, but easy to do, how about a costume that’s right out of fantasyland? They say the unicorn’s a mythical beast, but you can bring one to life this Halloween. All you need is cone made of posterboard or styrofoam covered in white cloth, and a small, white sheet or pillowcase attached to your pooch’s collar. It’ll have you looking around for leprechauns, fairies, and rainbows. No Halloween would be complete without a four-legged hot dog running around on trick-or-treat night. This easily-strapped-on costume comes in five sizes and includes fake mustard and relish on a frankfurter, inside a bun that envelops your pet. If you’re short on time and won’t have an opportunity to create something with your own two hands, this is a great way to get Rover ready to party. Halloween should be a time of fun and frivolity. While you’re outfitting your pet for a costume, don’t forget to provide for his safety, whether he’s going trick-or-treating with you or attending a party as your guest. The last thing you want is to spend the evening driving around town with a flashlight, frantically calling his name out the window.